The MET Gala is most looked forward event for Hollywood celebs and no wonder every year we witness something new. Commonly referred to as “fashion’s biggest night out,” the Met Gala 2018 is a peak of iconic style. A fundraising benefit for the Metropolitan Museum of Art in New York City, the event welcomes celebrity stars, young creatives, and industry paragons alike. The stars never fail to surprise their fans with ultimate costumes and makeup. While some steal the limelight some face major fashion disasters and get trolled badly. The top best-dressed celebs, however, become a heart stealer until the next year. 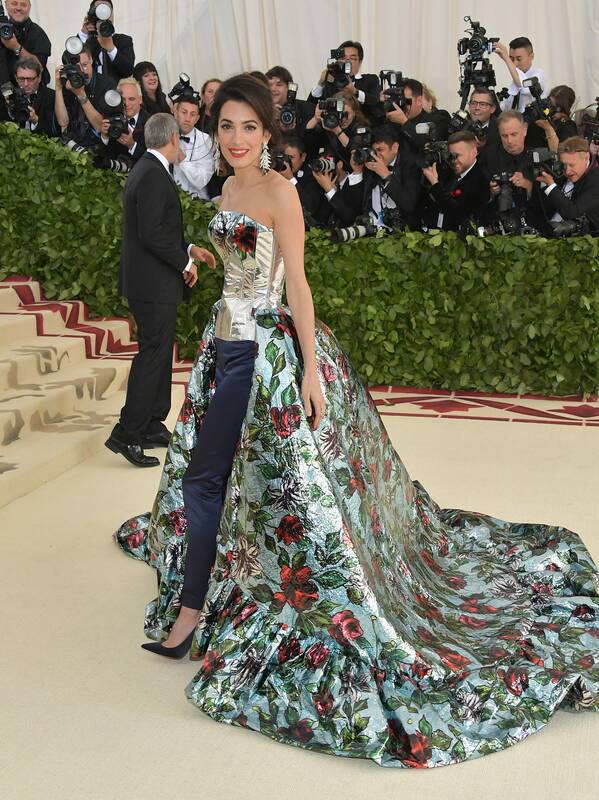 Here is a list of top 13 best-dressed celebs of MET Gala 2018. Amal Clooney the 40-year old barrister stunned everyone with her dress at the Met Gala. She is co-chairing with Anna Wintour, Donatella Versace, and Rihanna. Amal looked stunning in a strapless gown that had a silver bustier, dark slacks and a floral train that was at least four feet long. The 21-year-old model’s custom Chrome Hearts x Gareth Pugh outfit definitely stood out on the red carpet. Along with her eye-catching accessories, she wore a black latex corset, a long black skirt with crosses at the bottom, and a black coat with a high collar and sculptural sleeves. Rihanna was dressed like the female pope the Vatican’s history never had. She wore a white beaded Margiela corset mini dress under a full skirt, with a beaded bishop’s hat to match. The outfit was accessorized with a pearl anklet and a bejeweled crucifix necklace, Christian Louboutin shoes, Maria Tash jewelry, Cartier jewelry, and a custom Judith Leiber Couture clutch. This year was of a lot of headpieces. Diane adorned a powder blue high-low dress that packed quite a punch for such a short-fronted frock. The dress was designed by Prabal Gurung. The gorgeous jewels she paired with her dress were by Philip Treacy, and everything about her look was heavenly. Turn next for more celebrities on the next page. Why Prince William Never Wears His Wedding Ring ?